Here at Phones Review we often like to round up some useful apps for various events or occasions and as we head into the second week of Wimbledon 2012 we thought a few Wimbledon apps might enhance your tennis viewing. We’ve got some interesting Wimbledon app choices for you for both Android and iOS so read on for more details. All of these apps are currently available on Google Play or /and the App Store so simply click on the links to be taken directly to the individual apps to download or find out more. It seems important that we should start off with the official Wimbledon app first and this is for Android or iOS. Wimbledon by the All England Tennis Club for iOS is available at iTunes here while the official Android app can be found at Google Play here. The iOS app is free and compatible for iPhone 3GS, iPhone 4, iPhone 4S, iPod touch (3rd gen), iPod touch (4th gen) and iPad running on iOS 5.0 or later while the Android app is also free and suitable for devices running Android 2.2 or later. This app contains pretty much everything you could need to follow Wimbledon including live scores, results, play schedules, draws, news and player profiles. You will also have access to on demand video previews, highlights, features, golden moments and interviews as well as 3 channels of live Wimbledon radio. If you’re lucky enough to be attending Wimbledon in person you’ll also find a useful guide to facilities around the grounds. Next we have another Wimbledon app, this time for Android. It’s called Wimbledon Tennis Live Scores by TGNC and is another free app, this time for devices running Android 1.6 or later. This is a great app for the real tennis enthusiast as it includes all tennis live scores (ATP and WTA), ATP & WTA rankings, all results, ATP & WTA calendar, tournament draws and bet contest. This app also acts as a real community for tennis fans. 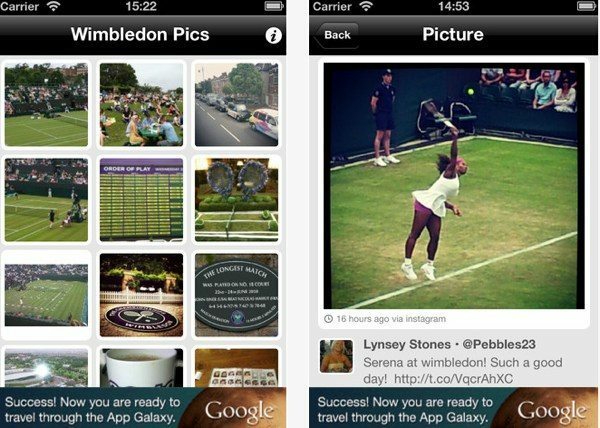 This time it’s the turn of iOS users and the next app is called Wimbledon 2012 Live Pics by OneSkyMedia. This is compatible wiith iPhone, iPod and iPad running iOS 4.0 or later and is another free app. It provides real-time photos of what’s going on at Wimbledon 2012 with images of not just the players and matches but the fans too, all taken only a few seconds previously. These can be saved to your phone or you can share them with friends via Twitter and Facebook, Tumblr or email. The final app in our selection is Wimbledon Grand Slam Tennis from BrightAl. This is a free Android app compatible for devices running Android 1.6 or later and gives news, results, details of match draws, photos and more. The developer stresses that this is an unofficial Wimbledon app but it looks pretty good and other features include Grand Slam Twitter tweets, live in-progress match results, Grand Slam player profiles and statistics, the Grand Slam tennis schedule and Grand Slam Flickr gallery. This is also good for those who want to share their enthusiasm for tennis as the app also has a live social chat room. Hopefully from these Wimbledon choices you should find at least one or two that suit your tennis passion needs. If you know of any other good Wimbledon apps then let us know by sending your comments. Alternatively tell us what you think of any of the above apps if you choose to try them out.